Is the sugar in fruit bad for you? Before you swear off fruit because of it’s sugar content, you need to read this. I hear it all the time. “I try not to eat fruit. Fruit has too much sugar.” Now that fat is no longer public enemy number one, sugar seems to have taken it’s place. 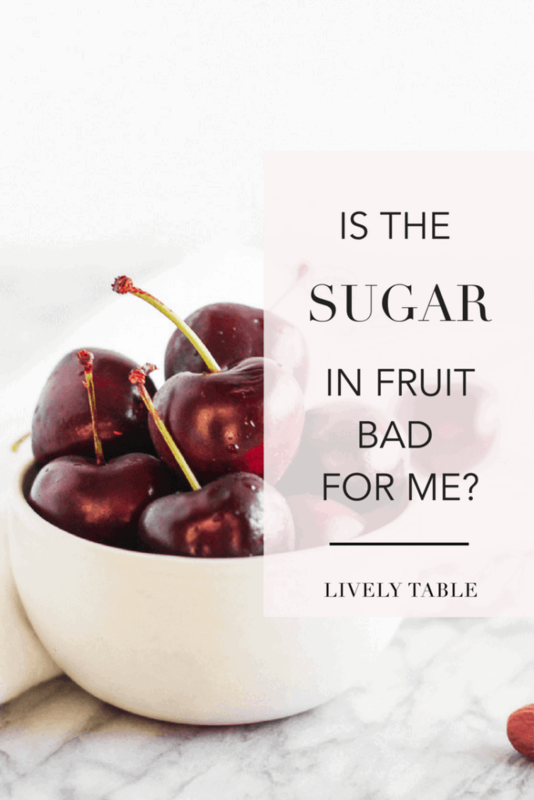 And nothing is safe from being targeted by strict elimination dieters for their sugar content, even foods that are perfectly nutritious, like fruit. So is the sugar in fruit bad for you? The truth is, there is a huge difference between added sugar, like good ol’ white sugar and even more ‘natural’ sugars like coconut sugar or honey, and the sugar found in fruit. The former are just that – sugar that’s typically added to foods to make them sweeter. Added sugars don’t come with additional nutrients (although I guess a case could be made for some, like honey and coconut sugar, but you’d have to consume a very large amount of said sweetener to get the trace amount of nutrients). And while fruit also contains simple sugars, it also contains a wide range of other beneficial nutrients, like fiber, vitamins, minerals, and phytonutrients, that most people already don’t get enough of. Fruit contains both soluble and insoluble fibers, which slows the release of the sugar into your bloodstream, unlike added sugars, which can spike your blood sugar pretty quickly. The fiber found in fruit also contributes to feelings of fullness and better digestion. And finally, it can help to feed the good bacteria in your gut. I’d say those are all pretty good benefits. Fruit also contains tons of vitamins and minerals, especially vitamins A and C, potassium, and magnesium. Different fruits contain different vitamins and minerals, but they’re all high in at least a few. Finally, fruit is one of the best sources of disease-fighting phytonutrients. All of the different colors of fruit (even the white ones) represent different phytonutrients, many of which have cancer-fighting antioxidant properties or inflammation-lowering properties. Eating fruit is associated with a lower risk of cancer, heart disease, and memory problems. And so, yes, while fruit does contain some sugar, it’s benefits far outweigh any effects the sugar found in fruit might have. In fact, research still links fruit consumption to lower risk of diseases like cancer, heart disease, and Alzheimer’s, and it is not associated with weight gain. That’s why the dietary guidelines recommend eating at least 2 servings of fruit daily as part of a healthy eating pattern. One concern with eliminating fruit is what food you’ll replace it with. In a perfect world, you might be able to eat vegetables where all the fruit once was in your diet so that you were still getting all the fiber, vitamins, minerals, and phytonutrients. But that’s highly unlikely. Vegetables aren’t quite as portable as fruit. (Nor do they taste as good on top of oatmeal, in smoothies, or dipped in almond butter. A broccoli and yogurt parfait? No thank you.) So you’ll probably replace that fruit in your diet with something else, and chances are, that something else won’t be as high in all those nutrients you would have received from eating a piece of fruit. And yes, there is the issue of diabetes. But diabetes doesn’t mean you have to exclude fruit from your diet. It means you have to eat a reasonable portion (one standard serving) at a time and not over-do it. It would also be wise to pair your fruit with protein or healthy fat to slow the absorption of glucose into your blood. But you still don’t have to cut out fruit, contrary to popular belief. And while it is possible to overdo it on fruit, it won’t do you much harm other than possibly giving you diarrhea. Because of the fiber in fruit, you likely won’t eat too much at once sine it’s filling. Do I have diabetes? –> No? No need to worry. Do I have diarrhea? —> No? Not eating too much fruit. *The less nutritious choice is totally okay sometimes if that’s what you’re really craving. But that’s a different talk for a different day. Bottom line? Fruit is super nutritious, so don’t eliminate it from your diet! The sugar in fruit is definitely NOT the same as added sugars. And if you’d still like to argue with me, let me kindly remind you that I am the dietitian here, and I have the student loans to prove it.